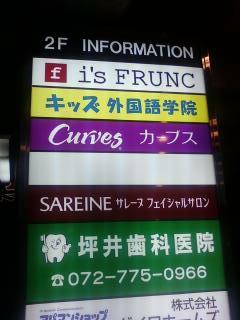 I'm not sure if "f" is FRUNC or if this is someone or something named "fi"'s FRUNC. Either way I don't like the sound of it. I see curves has spread to Japan now also. My question is about this "Sareine" place. What on earth is a シャルサロン? It's pretty obvious what word サロン comes from, and my dictionary says シャル is charm, but what's a "charm salon"? Do they sell charms? Like, for a charm necklace? Harmless trinkets, the Eastern equivalent of rabbits foots and four-leaf clovers in the west? Occult stuff, things purported to have actual mystical powers? Is it just a hair salon whose styles are supposed to make you charming? Do they teach people how to be charming? None of these ideas make very much sense to me. I'm grasping at straws here. What's a charm salon? I think if I don't find out the answer to that question, it may haunt me for weeks. The sign doesn't say 「シャルサロン」 ...it says 「サレーネフェイシャルサロン」 ("Sareine Facial Salon"). It's a place where (mostly) women go to get their face cleaned and massaged. Take the West Exit out of Hankyu Itami station. VERY CLOSE! I wonder if Blue Shoe works in the "foreign language gakuin" of that building. Whoa, someone's familiar with Itami. And no, I don't work at the ECC place - I'm a high school ALT.